Bloodstain pattern analysis (BPA) refers to the collection, categorization and interpretation of the shape and distribution of bloodstains connected with a crime. These kinds of stains occur in a considerable proportion of homicide cases. They offer extensive information and are an important part of a functional, medically and scientifically based reconstruction of a crime. The following groups of patterns can essentially be distinguished: dripped and splashed blood, projected blood, impact patterns, cast-off stains, expirated and transferred bloodstains. A highly qualified analysis can help to estimate facts concerning the location, quality and intensity of an external force. A sequence of events may be recognized, and detailed questions connected with the reconstruction of the crime might be answered. In some cases, BPA helps to distinguish between accident, homicide and suicide or to identify bloodstains originating from a perpetrator. BPA is based on systematic training, a visit to the crime scene or alternatively good photographic documentation, and an understanding and knowledge of autopsy findings or statements made by the perpetrator and/or victim. A BPA working group has been established within the German Society of Legal Medicine aiming to put the knowledge and practical applications of this subdiscipline of forensic science on a wider basis. What shape does a free falling droplet have? Which statement about the behavior of blood is correct? □ Small droplets fly over a longer distance than bigger ones. □ Blood droplets always have the same volume, independently from the shape and surface of the subject they originate from. □ Falling or accelerated blood oscillates a little bit. □ The viscosity of blood is slightly higher than that of glycerine with the same temperature. □ Free-falling blood droplets separate into smaller droplets when falling from a height of 3 m or more. When a flying drop of blood hits a surface four phases of impact can be differentiated. Which of the following is wrong? Which of the following blood stain patterns are not projected patterns? □ Exhaled or expirated patterns. What can be determined from a bloodstain pattern? □ The surface structure of the point of origin. □ Age of the blood. □ Human or animal blood. □ Blood of a living or a dead person. What typical form can be seen in a cast-off pattern? Which statements considering primary and secondary wipe patterns are true? □ A primary wipe pattern is created when a bloody object is moved tangentially on a surface leaving a trace (so called swipe pattern). □ Secondary wipe patterns occur when an uncontaminated, clean surface or object is tangentially drawn over a pre-existing bloodstain (so called wipe pattern). □ Wipe patterns can be helpful to determine a chronological order of various incidents. □ Secondary wipe patterns are almost always the result of arterial bleeding. □ Primary wipe pattern can only be created by arterial bleeding. □ If the object in question has been removed, it might still be possible to reconstruct its shape by examining the outskirts of the void. □ Blood will usually begin to dry from the outer parts inwards, toward the center of the stain. □ Projected blood stain patterns are produced when blood is spread on a target under pressure as opposed to an impact. □ Arterial patterns dry faster than venous ones. □ A blood clot describes the final product of blood coagulation. □ Luminol is used to identify minor, unnoticed or hidden bloodstains. □ Luminol gives a positive reaction to some vegetables and metals. □ After having used Luminol a DNA-analysis is not possible. □ In order to get a perfect result when using Luminol it is important to light up the room. □ The mixed Luminol solution is directly sprayed onto suspicious areas. Which statement considering documentation is wrong? □ Photos should always include a standardized scale and a fixed object in reference to the blood stains documented. □ In order to maintain an objective perspective, an upright position of the camera in reference to the surface being photographed is essential. 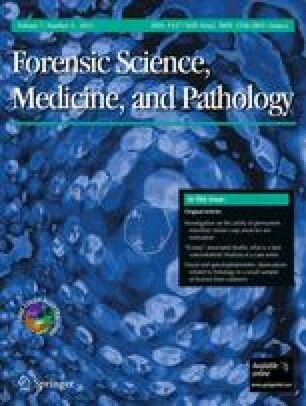 □ If a crime scene is not accessible, a blood stain pattern analysis might be possible by photographs alone. □ Overview shots are not important, since the details of a pattern matter, when calculating the angle of impact. □ If necessary, physical evidence on hard, immovable objects can be transferred from the crime scene and looked at separately. A primary wipe pattern is created when a bloody object is moved tangentially on a surface leaving a trace (so called swipe pattern). Secondary wipe patterns occur when an uncontaminated, clean surface or object is tangentially drawn over a pre-existing bloodstain (so called wipe pattern). Overview shots are not important, since the details of a pattern matter, when calculating the angle of impact.